Here are thousands of free kakuro puzzles suitable for printing. Each of my puzzles has only one unique solution. Need some help? Here's an excerpt from my book, Large Kakuro Volume 1, that explains how to solve Kakuro puzzles. Want to save some trees? Try my Interactive Kakuro Puzzles on your browser or iPad. My new series of Kakuro books, featuring large 14x19 puzzles, are available on Amazon. If you buy one, please submit a review - it'll help other people find them. Thanks! Looking for larger puzzles? 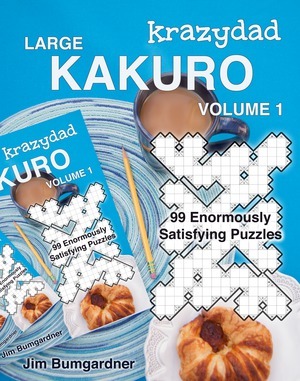 My latest Kakuro books, available on CreateSpace and Amazon, are made of 14x19 puzzles, my largest Kakuro yet! The above two sample files contain some puzzles from these books. I offer puzzles in two formats. The krazydad format, which I prefer, retains the visual symmetry of each puzzle, by showing each clue twice inside a triangle, on each side of the word.